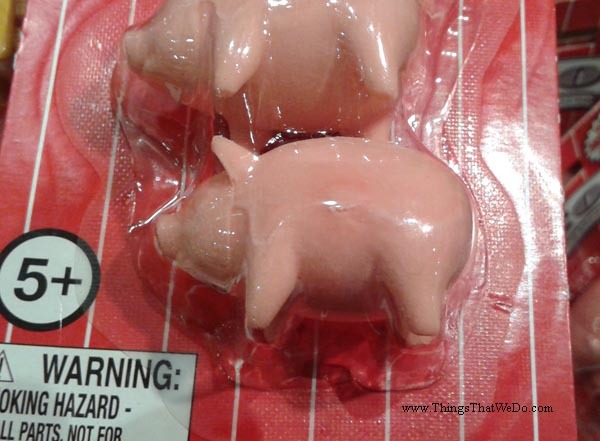 Pig Shaped Bacon Scented Erasers, anyone? 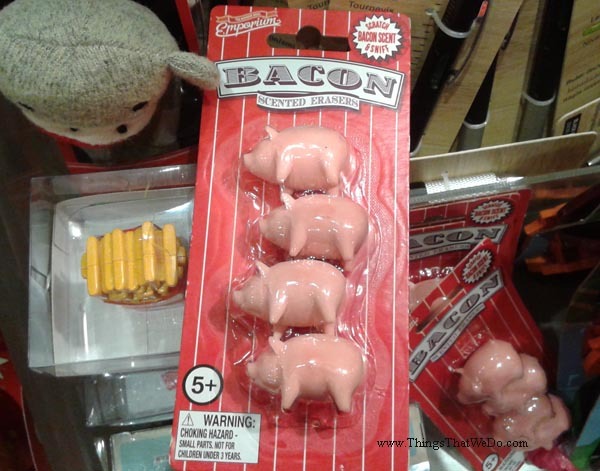 There I was at my local bookstore browsing the little doo dahs when I came across these pig shaped bacon scented erasers. I couldn’t believe it, pig shaped bacon scented erasers?! I mean, don’t get me wrong. They’re incredibly cute and I’m a big fan of bacon but for me, there’s a limit. Pig shaped bacon scented erasers for $4.95? That I’m not so sure of. Granted, I might buy them as a gag gift for a friend but I wouldn’t think to buy them for myself. I mean, what would I do with them? They’re too cute to use and might possibly smell too good for my own good! I mean, if they actually smelled like real thing I’d be tormented all day long wishing I could a giant plate of bacon. I decided not to buy them so I truthfully don’t know how they smell. For all I know, they might smell like anything but bacon (which I highly doubt). You see, there is no win in sight which is why I’d much rather give them away as a gag gift for a pal unless of course, they decide to share their pig shaped bacon scented erasers with me in which case I’ll still be in trouble. Hm…this is a much harder decision than it looks. Lovers of bacon beware, these bacon scented erasers from Emporium may be too dangerous to have around!